The Farnham Wayfarers are so named for a purpose, they are a group of cyclists who enjoy led rides which start from The Maltings, Farnham or from nearby. These rides all visit places of interest, views and scenic countryside. 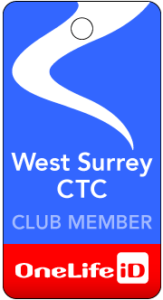 Newcomers might wish to start with the Easy Riders group – 3rd Sunday of month – which meet at venues either in Farnham or close by. The ride is 18 to 25miles at a gentle pace of 8mph . These morning rides appeal to people new to cycling, families, people coming back to cycling and to those who don’t want to go too far. These rides incorporate a mid morning coffee stop. On the 2nd Sunday of the month there is always a ride starting from The Maltings, Farnham of approx 40 miles at a pace of 10mph stopping for a pub lunch. These rides are led by different leaders which adds variety and interest. In summer months extra rides are arranged, a night ride from Portsmouth and riding The Shipwrights Way plus others. On the 1st Wednesday of the month, starting from The Maltings, Farnham is a ride of 40 – 45 miles at a pace of 10 -12mph. These rides are on minor roads through Hampshire, Sussex and Berkshire. There are stops for morning coffee and a pub lunch and riders are welcome to join the group for all or any part of the ride. In summer months extra rides are arranged meeting at places such as The New Forest and The Test Valley plus others.